We’ve all been there, show up to a spot to have people say, “you should have been here yesterday” or “last week was great”. 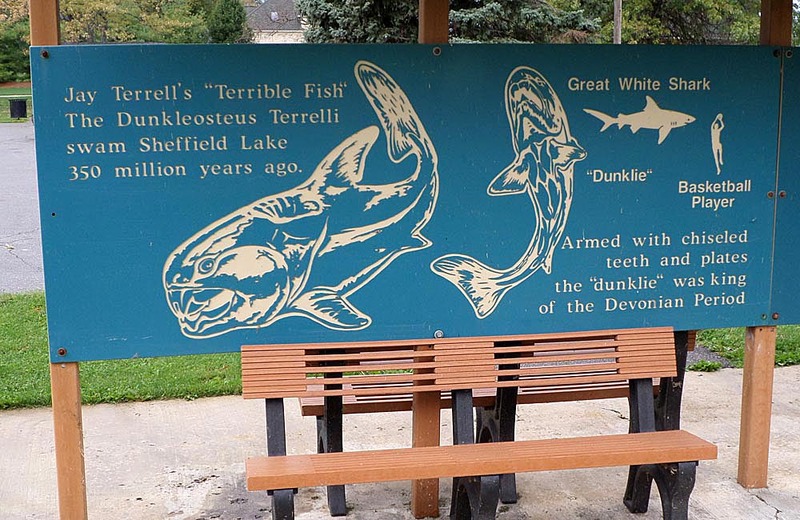 Well in this case, you should have been here 350 million years ago… that is if you wanted to catch a 10 meter (nearly 33 feet) Dunkleosteus. A model of Dunkleosteus Terrelli, that’s one bad fish! Driving along Lake Road (Route 6) in Sheffield Lake, Ohio, you will find a lessor known destination called, Shell Cove Park (map). It isn’t widely popular as it basically consists of a few benches with a view of Lake Erie. Hard to compete for popularity when there must be a dozen or so lakefront parks within 5 miles that offer a combination of trails, picnic areas, beach and/or fishing access. What is special about this park, is what you can learn from the Ohio Historical Marker and a kiosk at this location. 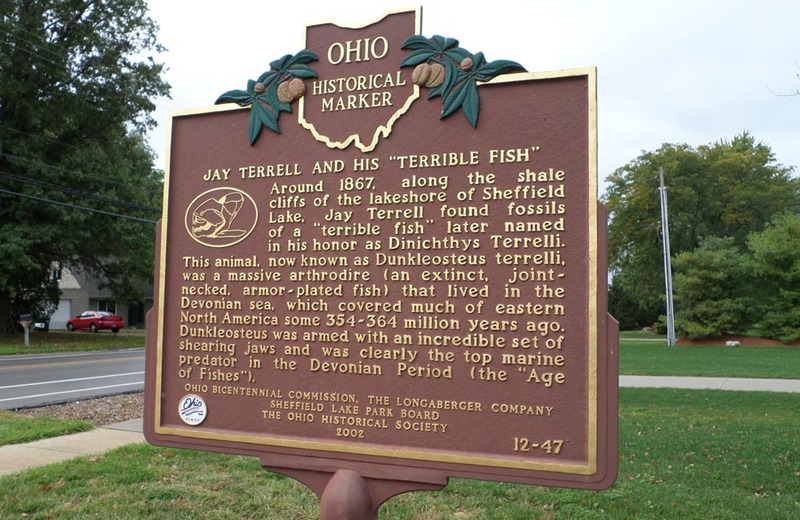 You can read below on the photos (click to enlarge), but it basically describes how Jay Terrell, sometime around 1867, found the fossil of what he called a “terrible fish” in the shale cliffs of Sheffield Lake. Being that I love all things fish related, and especially big toothy fish, I think it is fascinating and wickedly cool to have the fossils of this fish found here. While for most people I wouldn’t recommend a long drive just to visit the park (add a lake view to my two photos above – and that’s the park), it is worth stopping if your route happens to take you by it. It also is very easy to plan something that would take you by it, as it is on the northern most east/west road. There are plenty of attractions either way from it!